Chris just sent me this link to a talk by a guy called Hans Roslling who has started gapminder.org where you can get this access to amazing statistical data on world development (watch the video!) presented with this interactive flash software. 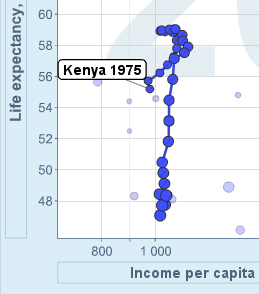 Naturally I selected Kenya and got this story: the trail of blue blobs show Kenya’s Life expectancy against Income per capita from 1975 – 2004. Go there and try it for yourself! The Wikipedia page on Kenya has a good story for their economic development with rainfall playing a big part. The new economic reform policies from 1993 aren’t obvious to me from this graph, however. Life expectancy looks like the more interesting axis than GDP. The turning point up there at the top is 1984 – 1987. The Wikipedia page on AIDS reminded me of the likely story. The most fascinating part for me, however, is the little bounce that it does at the bottom. You really have to go there and watch the animation for yourself to see this. The lowest point (life expectancy) is 2002, since when both life expectancy and income have increased. 2002 was when Kibaki finally replaced Moi. Could that sudden change in life expectancy possibly have anything to do with the road safety reforms? This entry was posted on Saturday, February 24th, 2007 at 9:19 pm	and is filed under Uncategorised. You can follow any responses to this entry through the RSS 2.0 feed. You can leave a response, or trackback from your own site.